Sangeets have become a norm in South Indian weddings now, and with good reason – they’re so much fun! While participating them in is awesome, the question of what to wear is most tricky when it comes to Sangeets (especially when you’re not the bride), after all, it should be comfortable enough to dance in while still being “party” appropriate. Worry not! We’ve got you covered – here are the latest and most awesome Sangeet Outfits that you can wear for the next Sangeet you’re going to. Ever since Deepika sported them in Bajirao Mastani, Shararas have been having a moment, and how! Shararas are long, loose and flowing pants, similar to palazzo pants. They can be paired with long or short kurtas, and look awesome both ways. 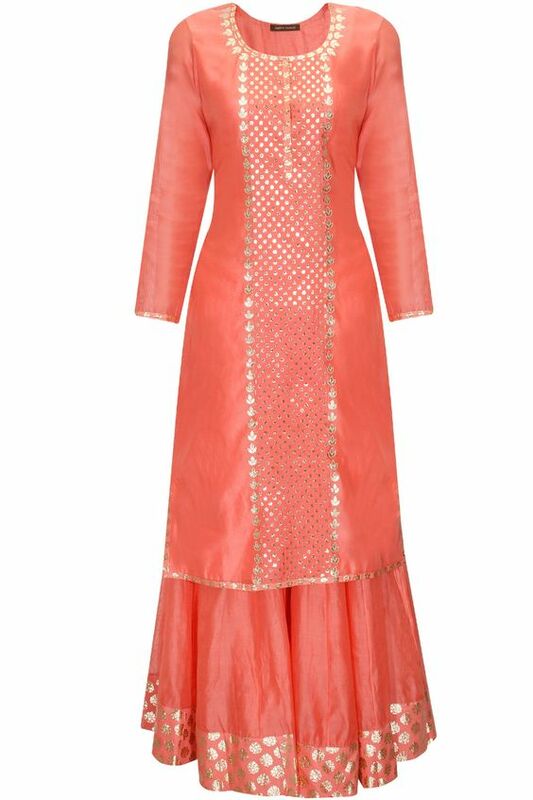 A short kurta makes the outfit fun and young, whereas the longer kurta gives stature. Bonus: These pants usually have an elastic waist and are perfect for sangeets that have endless buffet tables! 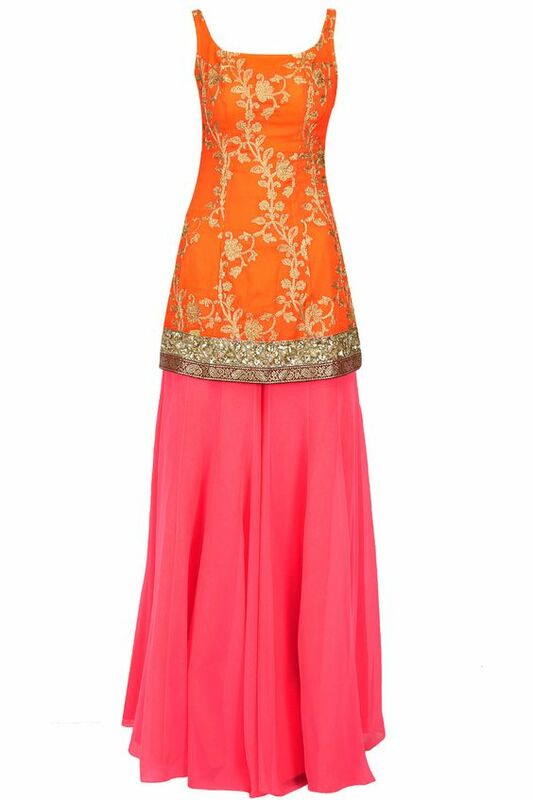 Sharara outfit by Ohaila Khan. Photo from Pernia’s Pop Up Shop. 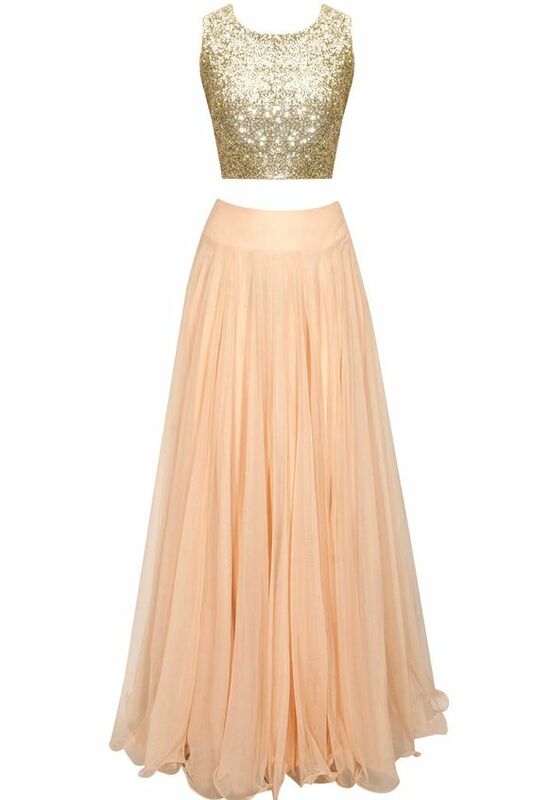 Forget the conventional Lehenga and instead go for a crop top lehenga! Crop tops are all the rage because well, they’re adorable, and the best thing about the crop top lehenga is that most times, the pieces are practically separates, which means you can swap them in for different blouses/skirts and get multiple looks without spending much money. Also, the crop top is a top, as opposed to a blouse, which means you can ditch that nosy dupatta altogether and focus on the dance floor! Payal Singhal for Spring/Summer 2015. How adorable! The Pakistani suit is essentially a long kurta paired with cropped cigarette pants. They are extraordinarily chic to the point where I wonder why they aren’t a major mainstream style already! These babies will make you stand out in a sea of lehengas and anarkalis, and are graceful enough for you to reuse them at every other formal party you attend. 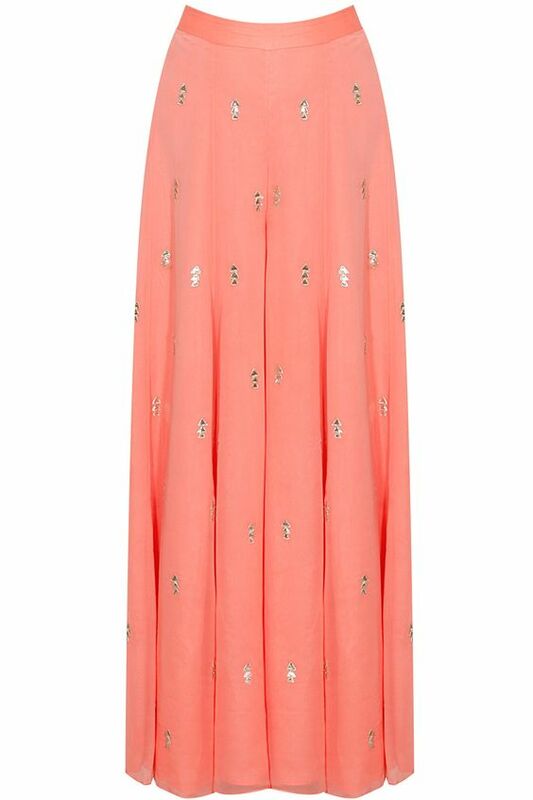 So what style are you going to flaunt this wedding season? Tell us! And for more Sangeet Outfit inspo, don’t forget to follow our Sangeet Outfits board on Pinterest, where we religiously put together our favourite Sangeet/Mehendi fashion!